Industry consolidation doesn't have to be an ever-increasing threat to the future of independent resellers. Change is inevitable and, although political interests and incumbent market power can slow things down and extend the lives of businesses that would otherwise shrink or be eliminated through competition, ultimately, it cannot be stopped. Furthermore, the longer the market has been constrained, the more dramatic the change when it finally takes place. The old saying “knowledge is power” has never held more truth than it does today. However, thanks to the internet, never has so much knowledge been accessible to so many. As little as one generation ago, valuable information could still be held closely within small groups of powerful individuals or corporations, thereby allowing them to leverage what they came to know to their advantage. Today, for determined individuals seeking information, it can usually be found with a few clicks and an appropriate investment of time. Therefore, the advantage that used to be enjoyed by the privileged few is reduced as individuals empower themselves with the information, they never previously had access to. For smaller business enterprises, this information can be combined with their greater operating flexibility and with their personal relationships in local markets to start to build advantages over larger rivals. Chinese capital, along with 15-years of investments in aftermarket cartridge technology, has permanently changed the status and the potential for the aftermarket. We are deep into the consolidation of the office products industry and now the action is moving to the remaining Original Equipment Manufacturers. The Chinese capital is a game changer in the final stages of the aftermarket consolidation. Will Clover be a player or not? The final players in the distribution of office products have been through twenty-years of consolidation. What next now e-commerce is changing the shopping experience? What’s it going to take to pull this off? There’s no silver-bullet solution, it’s time and effort. Who’s going to step up? For veterans in the office supplies industry, patents, and the potential for disputes, has been a way of life for 25 years or more. I clearly recall my first experiences back in the early nineties and the steep learning curve that followed. Working for one of the larger aftermarket manufacturers at the time, patents and the potential for litigation became a daily concern. As 1995 rolled around we faced concurrent litigation from three global OEMs and, while never directly putting the company out of business, it became a major distraction for management and was certainly a contributor to an eventual Chapter 11 bankruptcy proceeding. There have been many developments and changes over these 25 years. Throughout this period and despite these changes, every aftermarket manufacturer and reseller has had to continue to keep a watchful eye out for the constant threat of patent disputes. The industry has evolved to the point where only the largest manufacturers can afford the legal resources to locate, research and understand all the relevant patents. They alone have the engineering resources to develop workable design-around solutions needed to safely bring high-quality, competitive products to market. Thus, resellers in the developed economies of Europe and North America have mostly come to rely on these larger players to stay in business. Behind these manufacturers is a network of advanced technology companies devoting their engineering resources to supplying critical components that also help the aftermarket overcome ongoing intellectual property challenges. Overall, the depth of technical resources now supporting the aftermarket is quite remarkable. More recently there have been stunning advances in the capitalization of the top tier of Chinese manufacturers with multiple public stock offerings taking place during 2015 and 2016. Who would have thought that Ninestar, barely fifteen years from founding, would have successfully completed its multi-billion dollars offering for its Apex chip business? With these developments and events, the manufacturing industry for aftermarket office supplies has passed a major tipping point and can no longer be litigated out of existence. The combination of its intellectual property advances, technological know-how, and its raising of large amounts of capital, now makes this all but impossible. In earlier years, such an "extinction" event remained a possibility and may even have been one of the OEM motivations for litigation as a tactic to try and bleed the aftermarket to death. The aftermarket has passed a major tipping point and can no longer be litigated out of existence. However, although the aftermarket is here to stay, I'm not suggesting for a moment that the threat of patent litigation has diminished. In fact, if anything it's probably increased as will be explored later in this book. Think about it this way, just like global giants such as Apple and Samsung litigate against each other, neither is going to put the other out of business. Some money may eventually change hands and the lawyers will rake in huge fees, but business continues. 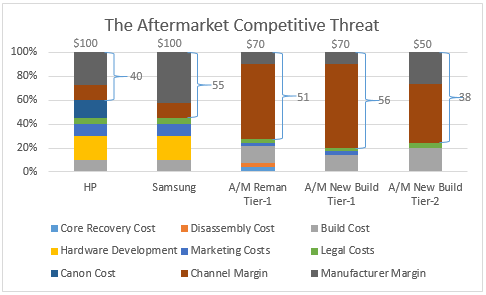 A similar scenario to the Apple Vs. Samsung example referenced here now exists between the OEMs and the remaining global aftermarket players in the imaging supplies business. Litigation around patent disputes will continue but neither side is going to put the other out of business. Reaching this tipping point is likely to have numerous ramifications for the OEM and aftermarket sectors as will be examined throughout this book. Later in this paper, we will examine the potential for the aftermarket to significantly increase its share of the overall market in the western developed economies, particularly the United States and Canada. Most industries experience consolidation - there are few exceptions and the office products and supplies industry is certainly not one of them. In the first section, we explained our rationale for believing the aftermarket has passed a significant tipping point and then hinted toward the foundation that's been established for the aftermarket manufacturers to increase market share at the expense of the OEM's. In this section, we're going to expand on why we believe the prospect for an upcoming battle for market share is motivating a new phase of consolidation as the OEM mergers endgame moves toward its final stages. Hewlett Packard 48,000 3,800 8% Acquiring Samsung Printer Div. There are twelve companies on this list of OEMs but, a quarter of them (Lexmark, Samsung, and Sharp), are already in the process of being merged into other entities. Hewlett Packard split into two separate entities at the end of 2015 and Xerox did the same in a process that was completed by the end of 2016. Both restructurings were designed to separate the mature hardware and supplies business from the (perceived) higher growth potential of the consulting and services businesses. In establishing standalone enterprises focused on printing and supplies both entities are (or will be) better positioned for the merger endgame! We believe this group of OEM manufacturers will continue to consolidate and, within a few years, it's possible we could be down to as few as four or five companies. This is typical late-stage industry consolidation behavior. Sharp, with $20 billion in global sales, had been in a steep decline and lost over six billion dollars of its net asset value between 2010 and 2016. Foxconn stepped in to rescue an otherwise bankrupt corporation, mainly because they wanted the screen display technology for the Apple iPhone they assemble, and most likely not for the relatively small office printing and supplies business. It's difficult to imagine Foxconn (as a contract manufacturer) committing long-term to the office equipment business so, either expect to see it closed, or sold to one of the remaining Japanese OEM's. A $3.6 billion cash offer was simply too good to ignore. Lexmark, having exited the ink business in 2012, already knew it did not have the scale to compete with the larger players and did not have the resources, capital structure, or energy, to survive as an independent player in the merger endgame. In selling the business, it appears they acted in the best interest of their shareholders. HP didn't waste any time after its restructuring with the announcement of its acquisition of Samsung's printer division. Think for a moment about this development. Perhaps it really was motivated by a desire to establish a stronger presence in the so-called "A3" market as we've read in the press. We know Managed Print Services, widely adopted in this channel, are a "sticky" sale where the isolated cost of an ink or toner cartridge is obscured under the complexity of a cost-per-page model bundling cartridges with service, repair, and (sometimes) even hardware. Long-term contracts are certainly an effective way to protect market share from circling predators! Hewlett-Packard knows (along with all the other OEMs) they have lost the battle to eliminate aftermarket products from the competitive environment and that they need to position themselves to defend against the increasing threat posed by the aftermarket manufacturers and Tier-2 resellers. 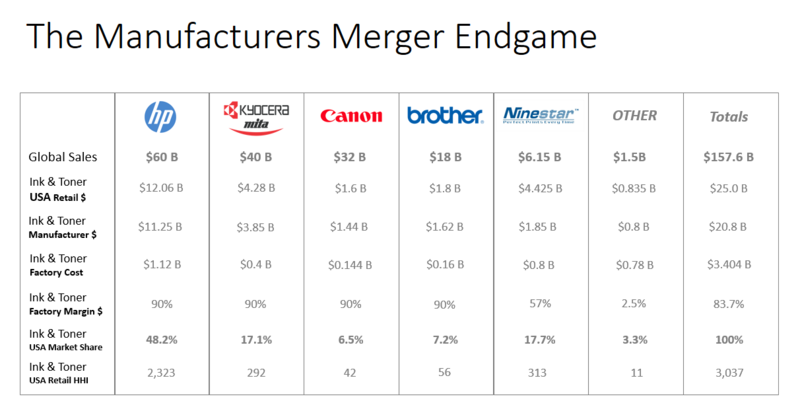 Whatever icing is put on the cake to explain the importance of a past and future relationship with Canon, the acquisition of the Samsung Printer Business is a massive development. We regularly use an example of a $100 OEM cartridge sale and its associated manufacturing cost of $10. With $90 of gross margin, you'd think the OEM's would be in a strong position to defend their market shares. However, take a look at the chart below - it helps demonstrate another compelling reason why the Samsung acquisition is to take place. We know (give or take a bit) it only costs around $10 to make a new-build cartridge that has a retail sale price of $100. However, the fully loaded cartridge cost is estimated at over $70 once hardware subsidies, marketing costs, legal costs and channel distribution (reseller margins) are all factored in. Look at the call-outs in the above chart. A portion of HP's current cartridge cost (when manufactured by Canon) must be the payment that's made to Canon. We don't know what that actual number is but, whatever it is, it's not part of the Samsung cost structure. 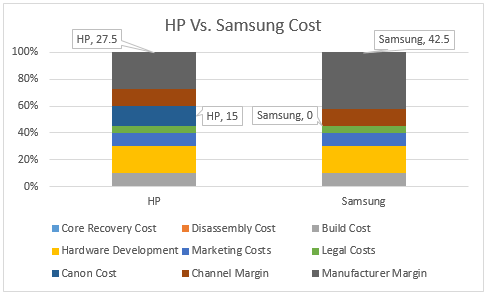 In our model, HP will improve its margin on cartridges from 27.5% to 42.5% after Samsung is fully incorporated. All the other costs are assumed to be the same but, in the future, HP will not be paying Canon a share of the value chain as the industry moves closer to its endgame. Now let's take a look at the competitive threat by introducing three aftermarket elements as shown in the chart below. The Tier-1 resellers selling aftermarket remanufactured cartridges generally sell at about a 30% discount to the OEM cartridges and there are a total of $51 margin dollars in the value chain assuming a $70 sale price. 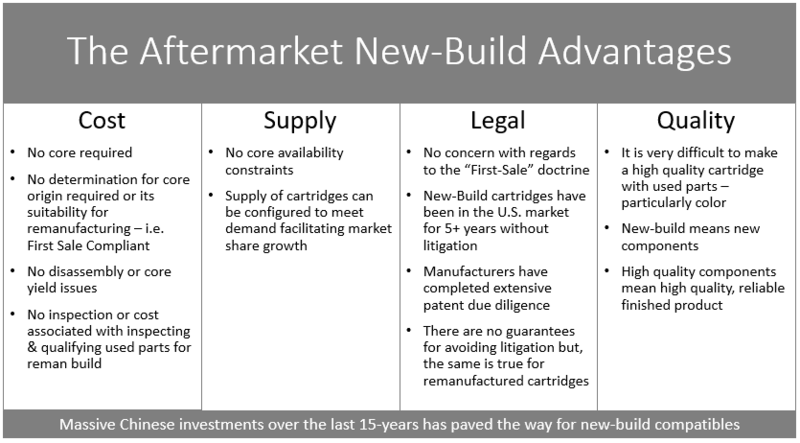 If the Tier-1 resellers elect at some point to sell new-build aftermarket cartridges, then our assumption is they will also capture the incremental margin dollars resulting from the manufacturers lower cost of goods sold increasing their share to 88% of the $56 then available. It's not expected there would be a reduction in retail prices. With the Tier-2 resellers represented in the final column of the chart, this is where it starts to get interesting. At an average 50% discount to OEM retail prices and a 30% discount to aftermarket Tier-1 prices, there's still room for $38 margin dollars or 76% of the projected sale price. Furthermore, this is a channel where the OEM has less influence to distort normal competitive behavior. The chart below is a little trickier to understand but it's important to do so in order to understand the OEM thinking and what's driving their endgame. The total margin dollars and how they are distributed. 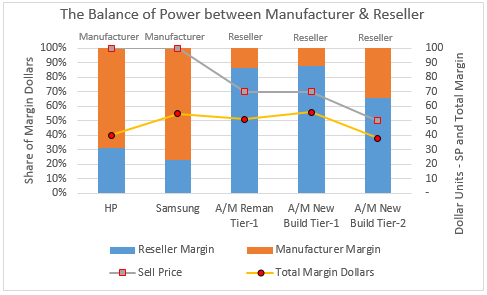 Who has the balance of power (as labeled above each of the chart columns) in the relationship between manufacturer and reseller as determined by the share of margin dollars? If the reseller margin (blue) is greater then the manufacturer margin (orange) then the reseller holds the balance of power and vice versa. We've already established the Samsung acquisition will reduce HP's cost as Canon is cut out of the picture. However, because HP (along with all the other OEM's) has the balance of power in their relationship with the resellers, none of this increase in their margin will be shared with the reseller and retail prices will not change. Over 80% of the margin dollars go to the reseller so they clearly have the balance of power in their relationship with the aftermarket producer. At this time, Tier-1 resellers have not adopted new-build compatible cartridges. Perhaps the OEM's dominant power position has been leveraged to exert influence - who knows! However, even if this should change for any reason, then any improvement in the total margin dollars will most likely go to the reseller because they have the balance of power and will demand the extra margin dollars while maintaining the ability to keep the selling price unchanged. The potential adoption of New-Build aftermarket cartridges by the Tier-1 resellers would be unlikely to represent an increased threat to the OEM's and their existing market shares. This is the sector of the resale channels from where the potential threat of disruption comes. The OEM's have much less influence over the behavior of this sales channel and when combined with the value proposition, it clearly has the potential to start to erode OEM market share. As shown in the graphic below, new-build cartridges have a lower cost, unrestricted supply, potentially less legal concerns, and higher quality than remanufactured cartridges. Tier-2 resellers leveraging these attributes should be able to establish a clear competitive advantage over the OEM's and the Tier-1 resellers of remanufactured products. We will be exploring more with regards to the Tier-2 reseller's opportunities and tactics for developing increased market share later in the paper. Have no illusions - there's no silver bullet, no overnight solution to accomplish this! It will be hard work and, anything short of the service and value proposition currently provided by the Tier-1 resellers will be inadequate and will fail. It's the threat of loss of market share that's contributing to the mergers and acquisitions activity now taking place between the OEM's, as the strongest acquire the weakest and attempt to extract as many costs from the business model as they can. The OEM's can't afford to lose market share and they can't afford to protect it in a protracted price war with the resellers. Given that it's unlikely the Tier-1 resellers will make any change to the existing pricing model, then the threat can only come from the Tier-2 sales channels. Most industries experience consolidation - there are few exceptions and the office products and supplies industry is certainly not one of them. In the first section of this paper, we explained our rationale for believing the aftermarket had passed a significant tipping point and that it was no longer possible for the OEM's to litigate it out of existence. In the second, we explained the OEM merger endgame, their power over the Tier-1 resellers, and the developing opportunity for the Tier-2 resellers to increase market share. Now, we're going to focus on the aftermarket manufacturers and their merger endgame. The aftermarket manufacturers in Western Markets such as the United States and Europe have already gone through significant consolidation. There aren't so many players left beside the Clover Imaging Group, LMI Solutions, and Turbon. In China, although there are three or four dominant players, there are still hundreds of smaller enterprises and the consolidation process still has a way to go. 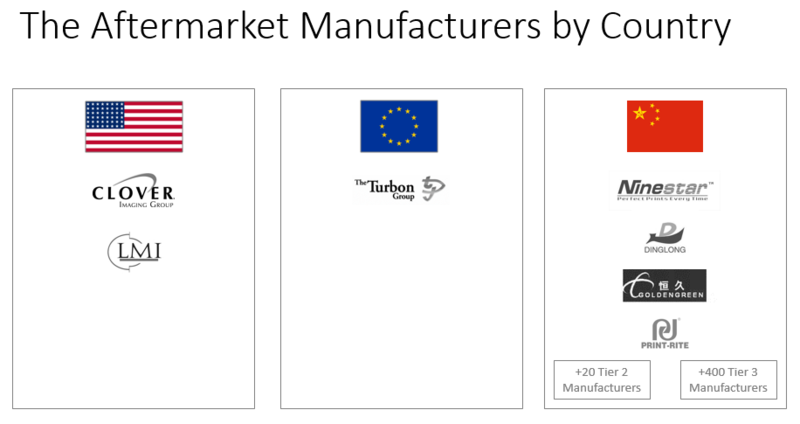 The aftermarket manufacturing landscape can be represented quite simply as shown in the image below. In order to understand how the aftermarket merger endgame may play out, it's necessary to understand how influential the roles of the new Chinese manufacturing "superpowers" are expected to be. One way to start to accomplish this is to look at the market capitalization table below. The financial firepower of the aftermarket manufacturing industry is now located in China. Never has the office supplies aftermarket industry been this well capitalized. 95% of the total estimated global market capitalization for aftermarket manufacturers is associated with a small group of four Chinese manufacturers. Nearly 60% of the global market cap is represented by Ninestar's Apex Technology chip business alone. In mid-2015 Ninestar (Apex), after its $1.5 billion public offering, acquired Static Control for around $60M. In doing so, it eliminated its major competitor in the cartridge chip business and established a foundation for distribution into the United States. In a transaction due to close at the end of 2016, Ninestar / Apex Technology (in association with PAG Capital and Legend Capital Management) is acquiring Lexmark for $3.6 billion in cash and, for the first time, there's a major crossover event taking place between aftermarket and OEM. What will we be calling Ninestar / Apex in the future, an OEM or aftermarket company? Hubei Dinglong has seemingly emerged out of nowhere and assembled a vertically integrated manufacturing organization through a series of acquisitions including RE Tech, Kolion, and Mito. The first of the top tier Chinese aftermarket manufacturers to go public back in 2010 and now reporting over $1 billion in annual sales. Suzhou Goldengreen Technology made a major distribution play into western markets with the 2015 acquisition of the Cartridge World global franchise and subsequently carried out a modest IPO on the Shenzhen Stock Market during mid-2016. Print-Rite, founded in 1982 (twenty-years before Ninestar, Dinglong, and SGT), and the early pace-setter as Zhuhai started to earn its title as the "Imaging Capital of the World", seems to have lost its strategic direction despite its vast intellectual property know-how and compatible new-build cartridge technology. Apart from a small stock offering related to its ink business, there's been no obvious activity necessary to keep pace with the three leading players merger and acquisition or capital raising events. Clover was the 900-pound gorilla until the mid-2015 acquisition and capitalization events at Ninestar took place. Their model is largely based on remanufacturing for which, as we've previously explained, there's a cost disadvantage compared to new-build cartridges. Clover doesn't have the technology to make new-build compatibles, although they certainly have the relationships to outsource them should they choose to do so. However, should they be forced to go down this outsource path, they'd end up with a higher cost and a similar problem to that which HP experienced due to their dependence on Canon as a supplier. Longer term, such an arrangement would not be an ideal solution because of the higher cost. As a result, Clover is caught between a rock and a hard place with regards to the expected transition from remanufactured to new-build cartridges and lacking the technology to move along with this transition. Now Clover must decide whether or not it wants to be part of the merger endgame. No, then they have to sell. Yes, then they have to acquire new-build technology which, in turn, means they must acquire a Chinese manufacturer with the necessary capabilities. LMI Solutions is a private, U.S. based company that's experienced rapid growth over the last five years during which time has carried out some strategic acquisitions, including Global and Printers Direct for remanufactured printer capabilities and also PartsNow for repair parts. Incredibly strong inside its dealer base with industry-leading Managed Print Programs. Although selling most of its cartridges under cost per page programs successfully shields them from transactional price comparisons, their model is based on remanufactured cartridges. They don't have strong core recovery programs (like Clover does) and have the higher costs associated with remanufacturing. At some point, I'd expect them to sell to a manufacturer positioned to survive the endgame. Turbon, a long-established German company founded in 1962 and around since the times of molding plastics for the ribbon industry. A closely held public company, listed on the German Frankfurt Stock Exchange, with around $120M in annual sales and consistently providing positive returns to its shareholders. A survivor no doubt, but a player in the merger endgame, I don't think so. Again, a company that doesn't have the new-build cartridge technology, and without strong managed print service programs, they are very exposed to transactional cost comparisons. Ultimately, the new-build cartridge technology is expected to win over the remanufacturing model. So .. what's the outlook for the endgame? 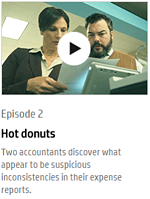 There are only two scenarios - one with Clover and one without. If Clover stays in the game, then look to them acquiring Print-Rite. It's simple if they don't then they can't get access to new-build cartridges and, because the remanufacturing model ultimately loses to the new-build model, they will fail without new-build. Unfortunately, there's nothing simple about a U.S. company acquiring and operating a Chinese company. Look also to LMI Solutions and perhaps even Turbon falling to the Clover Imaging Group if they (Clover) decide to stay in for the endgame. If Clover decides to exit, then who would acquire them? Perhaps a new private equity partner buys in and they remain an independent entity for the endgame, just with different investors. However, I think this outcome is less likely as it may be difficult to get sufficient interest from private equity and a satisfactory valuation as part of a mature industry, probably experiencing a flat top-line, narrowing margins, and increasing competitive headwinds. That leaves a strategic acquisition and it can only be by one of the top tier Chinese companies - i.e. Ninestar, Dinglong or SGT. In China I expect the consolidation to progress at a rapid pace. Underneath the top three or four Tier-1 companies, there are twenty or so Tier-2 manufacturers and then 400 or so Tier-3, most of whom are struggling financially. The best of the Tier-3's will be acquired by the Tier-2's, who will ultimately be acquired by the Tier-1's. As can be seen from this graphic, I've favored Clover to remain for the endgame and, ultimately, for there to be three entities left standing; Clover, Ninestar and a Hubei Dinglong / SGT combination. We'll soon see what path Clover actually chooses to go down and will then have a more definite picture of what the final aftermarket manufacturing landscape will look like. The next section focuses on the reseller's merger endgame and, in particular, some of the implications of the busted Staples acquisition of Office Depot. The theme will continue to be the impact of the Chinese money, the end of the remanufacturing model, and the likelihood of more widespread access to, and consumer acceptance of, the aftermarket alternative. Most industries experience consolidation - there are few exceptions and the office products and supplies industry is certainly not one of them. In this section we're going to explore some scenarios for the reseller's merger endgame and the impact this may have on the future of the aftermarket for office products and supplies and on the independent resellers. There are many resellers of office products and supplies. At first sight, most observers would automatically assume it's a very competitive, and diversified reselling environment. In fact, by our estimate, there are over 5,000 resellers in the United States alone. However, on a closer look, and as demonstrated in the chart below, 83% of the estimated $25B in U.S. ink and toner retail sales are conducted by less than 2% of the total number of resellers. For the purposes of developing an understanding of the reseller's potential mergers endgame, there are two events of particular interest to us. Firstly, the busted Staples, Office Depot acquisition and, secondly, (very much related) the definition of the market as may be determined by government authorities, for the purposes of deciding whether a proposed acquisition should be allowed. Understanding these will help us to better understand what may happen in the future. There have been many studies surrounding the characteristics of industries over time but, it's generally accepted that in most industries, there will be consolidation and that market concentration will develop. In order to measure how concentrated an industry is, two calculations are widely used by Fair Trade Authorities, such as the FTC, in determining whether or not proposed acquisitions should be allowed to proceed. 1. The Concentration Ratio (CR) is calculated by adding the percentage share of the largest enterprises in the particular market or industry. Usually, the top three are used (hence the label CR3) so, for example, if the top three companies have a 50% share then the CR3 = 50%. 2. The Herfindahl-Hirschman Index (HHI) is calculated by squaring the market share of all competitors and summing the total. For example, if the leading enterprise has a market share of 25% then 25 x 25 = 625, if the next largest player has a share of 15%, then 15 x 15 = 225, a running total of 850, and so on until all market participants are accounted for. The highest value for the index would be if there was a pure monopoly - i.e. one enterprise with 100% market share or 100 x 100 = 10,000. The opposite end of the scale would be pure competition, for example, 10,000 competitors each with one, one-hundredth of one-percent market share - i.e. (.01 x .01) = 0.0001 x 10,000 = 1. With that brief foundation now let's take a look at the resellers in the office products and supplies space. There are four scenarios shown in the following four tables. Scenario One and Three explain a pre-merger and post-merger market for Office Products and Supplies while Scenario Two and Four explain a pre-merger and post-merger market just for Office Supplies (ink and toner only). Scenario 1 - Let's look at this concept from the perspective of the United States market for all office products and supplies (estimated at an $85 billion annual market) with regards to the shares held by the various resellers in the various reselling channels. Scenario 2 - Now let's look at the same concept with a narrower definition of the market - i.e. the United States resellers market for ink and toner (excluding all other office products) and widely estimated as a $25 billion annual retail market. Look at how much difference there is between Table 1 and Table 2 with regards to the two key measurements, market share concentration, and the HHI index! Simply by narrowing the definition of the market from all office products to just that of the market for ink and toner, we can see the largest sales channel controls nearly 80% of ink and toner sales, with an overall HHI of 1,355. By definition, the FTC would define the overall office products market as "not concentrated" (HHI = less than 1,000) but the market for ink and toner as "moderately concentrated" (HHI is between 1,000 and 1,799). Scenario 3 - Now let's look at the same two scenarios already summarized in Table 1 and Table 2 but assume that Staples had successfully acquired Office Depot. I've highlighted the cells in Table 1 and 3 that have changed - in Table 1 they're green and in Table 3 they're red. You can see one big-box enterprise is eliminated as Office Depot is merged with Staples. Overall the reseller count drops from nine to eight, the overall HHI score increases from 993 to 1,677. This is still within the FTC boundaries of a "moderately concentrated" industry but, a big increase (684) from the pre-merger index score, and approaching the threshold for being judged as a "highly concentrated" industry. Scenario 4 - Now let's look at the final Table 4 and compare the more narrowly defined market for ink and toner before and after the planned acquisition of Office Depot by Staples. Once again, I've highlighted the cells that changed. In Table 2 they're green and Table 4 they're red. You can see one big-box enterprise has been eliminated as Office Depot is merged with Staples and the reseller count drops from nine to eight. The HHI score increases from 1,355 to 2,234 and the defined market now becomes a "highly concentrated" industry with a substantial increase of 879 index points resulting from the proposed acquisition event. Had the FTC used the market for ink and toner for assessing whether or not Staples should have been permitted to proceed with their acquisition of Office Depot, then I don't think the outcome would have been any different, as their objections would most likely have been similar. As it was, the FTC used the market for office products (excluding ink and toner) and further narrowed the market to argue that the Staples / Depot merged entity would have had monopolistic power in the B2B contract stationary sector. Staples failed to provide a counter-argument to the FTC's position and ultimately withdrew from the deal. The four scenarios I've explained above are plotted on the Industry Consolidation Curve shown below. This helps demonstrate the concept of what the FTC was concerned about with regards to Staples proposed acquisition of Office Depot and the progression toward increased market concentration and reduced competition. Staples made it clear during the 15-month failed acquisition process that they feared the increasing threat posed by Amazon, while also claiming there was significant competition from all the other traditional office products and supplies resellers. While competition from resellers such as CDW, Insight, Walmart, Target, Costco, Sam's, and even the OEM's is unarguable, the Court accepted the FTC's argument that the threat from Amazon in the B2B contract stationary market was in the future, not the present, and was, therefore irrelevant to the proceedings. The B2B contract stationary business conducted by Staples and Office Depot are the "crown jewels" of these two big-box resellers. As we know, neither Staples nor Depot can shrink their "brick and mortar" retail footprint fast enough to accommodate consumers changed buying habits. Walk-in retail is threatened by changing consumer purchasing habits, not specifically by Amazon. Both Staples and Office Depot have their own powerful e-commerce platforms to compete with Amazon. We know Amazon has a renewed focus on its Business Services initiative, relaunched back in April 2015, and it is this threat that probably keeps the Staples and Depot executives awake at night. However, while this may become a significant threat in the future, the difficulty for Amazon is their expertise is more geared to B2C than B2B and a B2C solution is not what B2B customers are generally looking for. There's a high level of integration between Staples / Depot and their B2B customers that Amazon cannot currently match. At least for now Amazon will most likely continue to find it quite difficult to win substantial portions of this B2B business. When looking at the financial indicators for Staples and Office Depot, it's clear that Office Depot is the weaker of the two entities. However, they're hardly in a distressed situation, announcing better than expected earnings in November 2016 and the sell-off of their European and other overseas operations. This indicates they are gearing up for a focused U.S. strategy and increasingly cost-efficient operations. As a result of its failed acquisition, Staples had to pay Depot a $250 million break-up fee. While both Depot and Staples, at time of writing, are trading at close to book value, Depot has informed its shareholders it's authorized to spend up to 100% of that breakup fee buying back its own shares. If the leadership at Depot doesn't believe in its future, then they wouldn't be likely to be spending this windfall on a buy-back of their shares. Depot can continue to finance closing their traditional twenty-five thousand square foot stores out of cash-flow. The target count for the traditional store footprint is down to 1,200 or so by the end of 2018. This represents a reduction of over 40% from the peak at the time of the 2013 merger with OfficeMax. Depot is accelerating the opening of their "stores of the future" with 120 or so of this 5,000 square-foot, "local neighborhood" style stores, planned by the end of 2017. I find it quite difficult to project what may come next in this sector of the reseller market. We know there's not going to be a combination of the two big guys, from which the most synergies could be extracted, and from which a more powerful enterprise could probably be created. We know both Staples and Depot have positive cash flow and strong balance sheets while Depot, at least, believes its shares are under-valued. Neither enterprise is distressed, or likely to be going out of business so, where may they be going? Longer-term, I do think both Staples and Depot face significant challenges and, of the potential scenarios listed above, I think, for now, a combination of options four, five and six are the most likely. Potential acquirers will sit on the sidelines while the market continues to mature. What about the other two channels? The outlook here may be more predictable. It's interesting that Office Depot still considers a brick and mortar presence to be important for local markets, as indicated by way of their plans for opening 120+ of their new "stores of the future" retail concept. These plans indicate that Office Depot believes there's still a need for a physical presence in local markets. This implies there may also be an opportunity for independent resellers leveraging their local footprints, so long as they develop capabilities to match the service and performance standards of Depot and Staples. However, regardless of whether or not the independent resellers can effectively compete with Staples and Depot in their local markets, I expect a significant thinning of the ranks. The strongest Tier-2's will acquire the best of the Tier-3's and will then, subsequently be acquired by the strongest Tier-1 players. Many of the weakest Tier-3 will simply go out of business. What most people may think of in terms of e-commerce and the future, may not be the way it plays out, at least not in the short and medium term. As we know, Amazon is the powerhouse of e-commerce even though Staples and Office Depot also have strong e-commerce portals. It is clear Amazon wants to break into the B2B office products channel and, we know, from Staple's efforts to convince the FTC to allow their acquisition of Office Depot, that they (Staple's) fear the threat of Amazon in this B2B space. Fortunately, at least in the short term, for Staples and Depot, it appears the Amazon B2C platform is not suitable to meet the needs of the typical B2B customer they currently serve. However, given Amazon's resources, it may only be a matter of time before they figure out a solution to this problem, and start to win share in this lucrative segment of the market. Overall, we believe the scope for new entrants in the Internet Reseller Channel, at least in terms of competing with Amazon, eBay, NewEgg, LD Products and even Staples and Office Depot, is very limited. It's possible, of course, that we could see some consolidation with Staples, Depot or even NewEgg perhaps acquiring LD Products. However, I don't see significant changes taking place with the current leaders that make up the Internet Reseller Channel, apart from the relentless advance of Amazon and the possible entry of Alibaba. However, Alibaba is a whole different story and I'll try and tackle that at a later time. In the next section, we'll be summarizing the mergers endgame before moving on to our perspective on the Consumer Adoption Curve and the likely opportunity for aftermarket office supplies in terms of improved market share. When viewed in conjunction with the mergers and acquisitions and the Chinese money, then it becomes much clearer in terms of understanding why it's likely there's to be a significant shift in market shares. There's already crossover between the OEM and aftermarket manufacturing sectors with Ninestar / Apex Technologies acquiring Lexmark, so I think it makes sense to summarize the manufacturing consolidation as one segment. The video clip below contains an animation illustrating a potential outcome of the manufacturer's mergers endgame that could take place over the next few years. Of course, I don't have a crystal ball, so it'll be interesting to see what each of the upcoming events are, and how each of them affects future thinking versus the current projection. Who would have thought Apex would acquire Lexmark and, who would have thought HP would be acquiring Samsung's Printer Business? So far as my thinking was concerned both deals came out of left field. So, the structure of the fully consolidated industry as projected in this animation may be no more than educated speculation but, it's a format that will be updated after each event does take place and will help us to project the final outcome well in advance, as the various currently possible options are eliminated one by one. It's difficult to see Xerox surviving as an independent enterprise in the final stages of the consolidation. Already we've seen Lexmark and Samsung throw in the towel and a similar outcome may be expected for Xerox in the not-too-distant future. However, any deal as I've speculated with HP as an acquirer would be likely to be closely scrutinized by the FTC and the outcome by no means assured. If HP is unable to acquire Xerox for anti-competitive reasons, then look to Canon potentially stepping in. Of course, I don't know the actual five or six names that may eventually be heading up the fully consolidated industry I've projected but, in short, I believe that's about the final number of enterprises that will be left standing at the conclusion of the endgame. Subject to the thinking of the Fair Trade Commission in Japan, it's not unreasonable to speculate that their industry may consolidate into two main segments - the A3 players and the A4 players, with perhaps Canon remaining as a standalone. For the aftermarket manufacturers, although it's likely the endgame will be dominated by the Chinese, I'm hopeful there will be three major entities left standing. Ninestar of course, a Hubei Dinglong / SGT combination and, finally, a Clover, Print-Rite, Turbon, and LMI combination. However, it's possible Clover may decide not to stick around for the endgame, so it could look quite different to my current projection with, ultimately, just one or two Chinese entities left to represent the global aftermarket interests. As is shown in the table below, a handful of global manufacturers with combined annual sales of nearly $160 billion, a CR3 of 83% and HHI of 2,500+, spells out an industry defined as highly concentrated with potentially monopolistic power. One country and one government agency would most likely not permit such a consolidation. However, multiple countries and multiple government agencies assessing mergers and acquisitions in light of their own individual markets, not a single global market, may well allow their individual consolidations to take place. The company name at the head of each column is used for illustrative purposes. While we believe the Japanese A3 and A4 enterprises could consolidate in this manner, we have no way of knowing that either Kyocera Mita or Brother may be the leaders in such an initiative. In the interests of simplification, we have grouped all the major aftermarket manufacturers under the Ninestar banner, rather than attempt to further crowd the table with three separate entities such as Ninestar, Hubei Dinglong, and the Clover Imaging Group. In drilling down to evaluate just the ink and toner segment, (2016 U.S. market size of $25 billion in retail dollars), and as would be supplied by these five or six enterprises, the market would be even more concentrated albeit with a slightly lower CR3 of 72% but with an HHI of over 3,000. I believe the margin dollars on the imaging supplies are one of the key drivers of the consolidation in the industry. The strongest manufacturers will participate in the mergers endgame only if they believe they can protect the existing business model and the high margins earned off the supplies. Of course, merging two large organizations leads to other synergies that may be vigorously extracted but, the crown jewels for future profits are ink and toner. This is so important for an independent reseller to understand because it means the days of $100 OEM brand cartridges are not going to go away anytime soon. Even if the overall market for office products and, in particular, ink and toner is entering a slow decline of 1% or so per year, then it will remain a large market for the foreseeable future, with plenty of growth opportunity for savvy reseller's attacking the top-end of the market. I'll be going on to discuss the Consumer Adoption Curve (as it relates to aftermarket ink and toner cartridges) and the location of the expected battlegrounds for market share in the next two sections. Suffice to say, these are the subjects that should be of most interest to independent reseller's looking for growth and opportunity over the next decade or so and (once they have a solid understanding of the market opportunity) just why it's going to be around for the foreseeable future. As explained in the previous section, at the broadest level, the reselling sector of the industry in the United States is not concentrated and remains very competitive. However, what we learned in May 2016 was that the FTC in the United States would not allow the merger of the two biggest reseller's, Staples and Office Depot, after they narrowly defined the market for office supplies (excluding ink and toner) in the B2B segment and determined the merged entities would have monopolistic power. Despite the failure of the proposed acquisition, I don't believe this means either Staples or Office Depot is off the table in terms of future M&A activity - just not with each other. I think the outlook for the merger's endgame and the reseller's in the United States needs to be considered in the context of the emergence of the three Chinese aftermarket superpowers (Ninestar, Hubei Dinglong, and Suzhou Goldengreen Technology) and their probable desire to increase market share for their products in the United States. 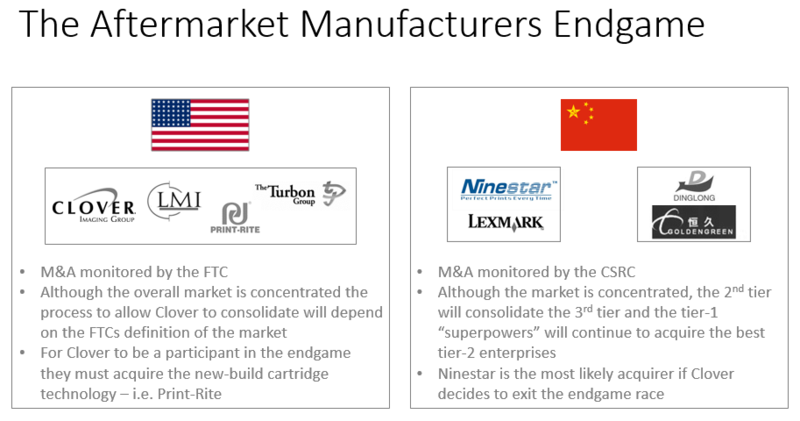 With Ninestar's 2015 acquisition of Static Control and SGT's acquisition of Cartridge World, we've already seen evidence that the Chinese will acquire U.S. companies with the distribution relationships that will further their goal to increase market share. We haven't talked specifically about it before, but China-based Han Group is in the final stages of closing their deal to acquire Ingram Micro, a major Information Technology distributor, for over $6 billion. Ingram is a significant player in the distribution of OEM ink and toner cartridges and, it may not be beyond the realms of possibility, that one or more of the Chinese aftermarket superpowers are already talking to Han Group about the possibilities of placing Chinese products into distribution through Ingram Micro. In this context, think about the Chinese potentially acquiring either Depot or even Staples. Now, I'm not suggesting that an aftermarket manufacturer such as Ninestar or Hubei Dinglong would go in this direction, but the Han Group or other similar Chinese investors may be interested. Regardless of who it may be (if anyone) then you can imagine the likelihood of relationships being leveraged to help place Chinese products into distribution through their new owners. Events of this nature just have the potential to completely change the way we've become accustomed to the existing "cartel" of OEM's, Tier-1 remanufacturer's and Tier-1 reseller's operating. Regardless, even if an event of this nature was to take place, I still don't see much likelihood of the existing Tier-1 reseller's pricing model (forced upon them by the OEM's and adopted by them for the aftermarket alternatives) will change. A Chinese investor acquiring (for example Office Depot) would not want to see that investment potentially compromised with radical strategies resulting from increased aftermarket cartridge sales at the expense of OEM. Loss of the OEM rebates for failing to achieve pre-determined sales quotas would be a risky strategy to follow - particularly as Staples (in this case) would be well positioned to compete for accounts potentially compromised within an aggressive "OEM to aftermarket" conversion strategy. So, just like with the endgame for the manufacturers is not likely to disrupt the existing cartel arrangements for pricing and market shares, then I believe the same is true for the merger's endgame for the Tier-1 resellers. Knowing this to be the case should provide significant reassurance to the Tier-2 resellers of office products that, looking "up" to the "Blue Ocean" of Office Depot and Staples customers and competing for that business, rather than looking "down" to the "Red Ocean" of the dog-eat-dog internet-based e-commerce marketplaces, will be a significant growth opportunity for many years to come. Again, we'll explore this opportunity in the next two sections as we deal with the Consumer Acceptance Curve as it may pertain to the supply of aftermarket ink and toner, and then to the battlegrounds we expect the fight for market share to take place in. 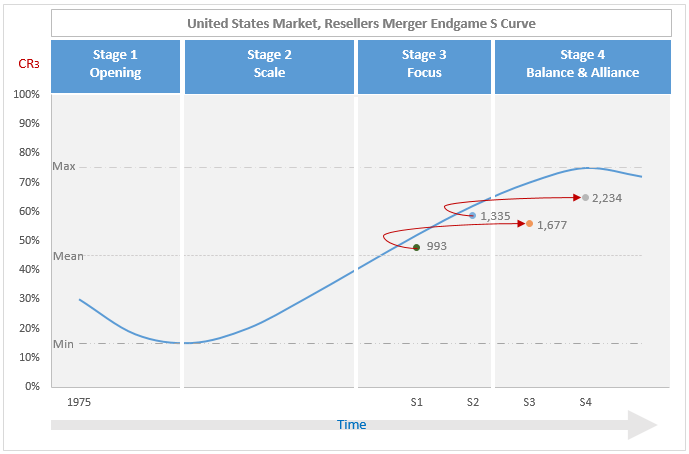 I can't finish this section on the reseller's merger endgame without a mention of Amazon. Although I'll cover their possibly disruptive role in the upcoming section dealing with the battlegrounds for market share, it's feasible they could enter the mergers endgame with an acquisition of either Office Depot or Staples. However, I think such a wildcard move would really test how serious Amazon is about this category as it would represent a significant shift from their existing growth strategy and involve considerable risks. For now, I'll put an event of this nature low on the probability charts but, then again, don't forget I didn't see Ninestar acquiring Lexmark or HP acquiring Samsung either! The market shares between OEM and aftermarket have been unchanged for many years. 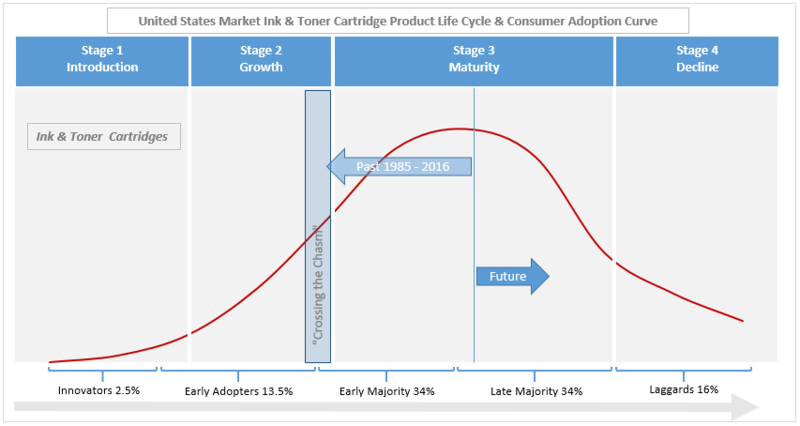 In this section, we're going to explain about the ink and toner product lifecycle and the consumer adoption curve as it relates to aftermarket alternatives. You're going to learn that the stagnation of the aftermarket proposition is mostly related to OEM blocking strategies and not to the lack of consumer acceptance of the aftermarket value proposition. I doubt the OEM's ever imagined a bunch of entrepreneurs would come up with a means to recover and remanufacture their original cartridges. They were surely confident their government-granted monopolies (by way of thousands of patents) would ensure no loss of market share. So, they did what all monopolists do, they exerted their power (in this case over the resellers), charged high prices for the cartridges, and enforced strict terms for continuing to allow them to buy and resell their cartridges. However, the resellers didn't like being dictated to in this manner, so they gave the aftermarket remanufacturers a break by providing a distribution outlet for their cartridges. As a result, consumers became aware of the cheaper alternatives, expressed an interest and quickly adopted the lower priced cartridges, despite their inferior technical performance. This was the OEM's "wake-up" call that led them to understand the aftermarket represented a serious long-term threat to their business model. The OEM's have always had a go-to-market business dilemma - they must price the printers low enough for mass adoption and then sell the cartridges at a high enough price to subsidize the losses incurred developing the installed base. If a significant loss of market share on the cartridges takes place, then the business model collapses. During 2012-14 HP cut a reported 10,000 resellers off from their products and imposed strict reporting requirements on its remaining authorized distributors, including the requirement to report whom they were selling HP brand products to. Imagine having to tell your supplier who your customers are, especially when they're already selling directly to consumers and bypassing distribution in some markets. Now, a manufacturer is entitled to set the terms for resellers of its products so there's nothing inherently wrong with HP from doing what they did, but, let's look under the hood for an underlying strategy behind these tactics. Never again would the OEM's make the same mistake and allow a single "engine" to develop a large installed base as they did with the original "SX" engine in the late 1980s and early 1990s. Today the life-cycle for hardware is drastically reduced with new models coming out at quicker intervals. It takes time and research and development expense for the aftermarket to develop new products, it takes a time to recover enough cores to place a new product in distribution and to be sure there are enough cores to keep it stocked in distribution. There's risk involved for the aftermarket to determine whether a new product announcement from the OEM is going to be successful or not and whether they should devote their efforts to developing an aftermarket alternative. The larger the number of new products launched by the OEM's the higher these aftermarket expenses and risks become. Back in the early days and ten products covered 80% of the market, now it takes hundreds of products to cover 80% of the market. There's an acronym out there known as "FUD" - it stands for fear, uncertainty & doubt and is usually invoked intentionally in order to put a competitor at a disadvantage. OEM FUD campaigns have been aggressively deployed since the aftermarket first appeared on the scene. 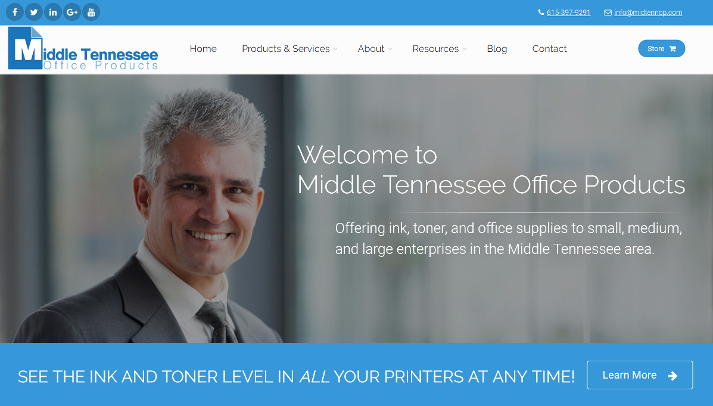 They sell managed print service contracts to their largest, their very best, premium customers who may have thousands of printers deployed throughout their organizations. These printer fleets are always made up of a variety of OEM hardware - i.e. there may be HP, Lexmark, Oki, Kyocera Mita, devices etc. When any of these OEMs prepare a multi-year managed print services contract to whom do they turn to for cartridges to fit on these devices? Well, you can be sure it's not their OEM competitors. HP is not going to Lexmark, and Lexmark is not going to HP, for cartridges to fit into the devices they need to service so, they go to Clover or LMI Solutions and source aftermarket cartridges - the same cartridges they would prefer to have everyone believe are technically inferior and unsuitable for consumers to use! The OEM's, the big-box retailers, the Tier-1 resellers and distributors, the Tier-1 aftermarket remanufacturers, all have done a great job in terms of logistics and customer service. All have invested heavily in information technology to ensure they can deliver quickly, reliably and cost-effectively. All have invested in state-of-the-art customer response systems (CRM) to ensure they can quickly and efficiently pull up customer history and records for purchasing patterns and problem resolution. The Tier-2 and Tier-3 resellers have allowed their larger competitors to get ahead in this crucial aspect of modern-day business and, of course, it has now become part of the overall blocking strategy. In the next section, we'll be presenting our view on where the battlegrounds will be, and what tactics may be utilized in the fight for market share. The success of many of the OEM blocking tactics is dependent on the existing cartel arrangement, (big-box retailers, Tier-1 resellers and distributors, and the Tier-1 aftermarket manufacturers), being preserved. Sure, it's possible one of the big guy's could break ranks and influence change but, I think that's unlikely. Our focus will be on the Tier-2 and Tier-3 resellers and distributors, with whom the OEM's have little to no influence over how they conduct business. In conjunction with the newly emerging Chinese superpower manufacturers of high-quality new-build compatibles - now, that's a new partnership which has the potential to carry on where those early pioneers of the aftermarket for ink and toner started out. 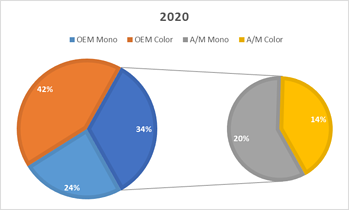 With the emergence of the Chinese aftermarket ink and toner manufacturing superpowers, we anticipate new battles for market share will take place between the OEM and aftermarket brands. In this section of the paper, we're going to explore where these battles are most likely to take place. We've already explained the aftermarket tipping point, explored scenarios for the OEM and aftermarket manufacturer merger endgames, the reseller merger endgame, and the consumer adoption curve as it relates to aftermarket ink and toner. The scene is now set to explore possibilities for market share development. Directly below is an illustration showing how office products get to market in North America. We already explained in Section 4 how the OEM's, leveraging their power over the distribution channels, effectively control market share between the original and aftermarket products. 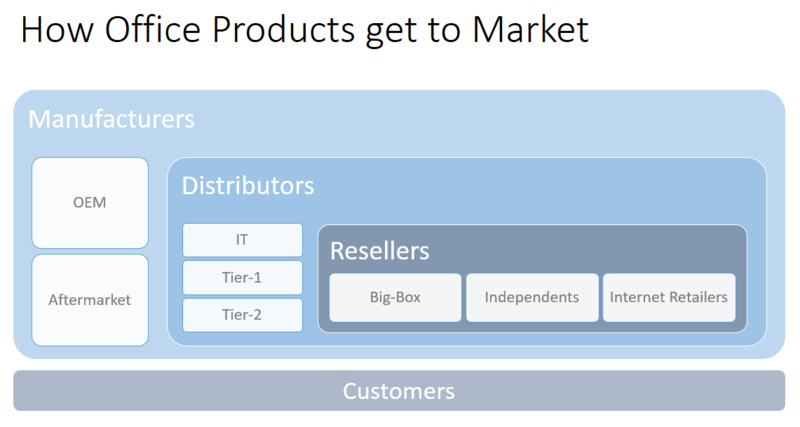 Now look at the second graphic below illustrating how, the 90% of consumers buying office products, choose to do so from the Big-Box and Tier-1 resellers and, consequently, only have access to the products offered by the OEM's and Tier-1 aftermarket manufacturers. Remember also, our earlier explanation with regards to how the OEM's control their market pricing and market shares through the rebate programs and other carefully deployed aftermarket blocking tactics. There's no way for the Tier-2 [Chinese] aftermarket manufacturers to access the 90% of consumers who currently choose to purchase through the Big-Box and Tier-1 resellers because these resellers elect not to place the Tier-2 products into distribution for their customers to select from. The OEM's, big-box and Tier-1 resellers have effectively organized themselves (or been organized) into a cartel, and there's no way for market shares to substantially change unless this cartel arrangement is breached. Note our comment at the foot of the graphic that the small group which makes up, what we've termed "the Tier-1 aftermarket manufacturers" (Clover Imaging Group, LMI Solutions, and Turbon) have, in fact, already effectively lost their Tier-1 status to the emerging Chinese superpowers. The Chinese aftermarket manufacturers have cost, capital and product (new-build) advantages and therefore, over time, have the power to breach the cartel that currently controls pricing and market shares. The OEM's surely recognize the emergence of the Chinese superpowers and the threat they pose to their business model. 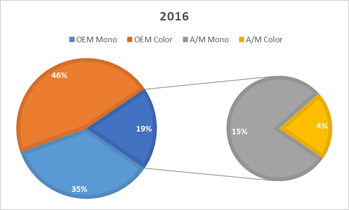 Of course, they want things to remain as they currently are, with an ongoing and steady decline of the aftermarket share due to shrinkage in the monochrome market and with their continued success preventing the aftermarket from breaking into the color market. How better to achieve this, and simply neutralize the Chinese threat in the process than by encouraging the big-box and Tier-1 resellers to transition from their current suppliers (Clover and Turbon) over to the Chinese? Remember, the OEM's control both pricing and market shares and, so long as the current cartel structure is preserved, they can ensure there will be no change to the pricing model or to the overall trend in market shares. In this scenario, the cartel could be preserved, and the Chinese simultaneously neutralized, simply by encouraging the Tier-1 resellers to replace their current suppliers. In doing so they'll probably get lower prices than they currently do from Clover, LMI, and Turbon, increasing their already substantial margins on aftermarket products in the process. Don't forget, the OEM's could also choose to buy compatibles directly from the Chinese in order to support their MPS contracts, just like they've already done with Clover and LMI. In doing so, they'd further neutralize the Chinese and make it less likely they'd go down a path to support resellers outside the cartel and attempt to build market share at the expense of the OEM's. Development of this scenario would provide a big boost to market share for the Chinese and a big loss to the current suppliers. However, so far as the OEM's are concerned, it's just a pocket shift and overall they could achieve their goal of keeping things the way they are. The cartel would be preserved - just one group of members would be changed from the current incumbents to a new group of [Chinese] members. Of course, Clover, LMI, and Turbon aren't going to roll over and let this happen without a fight. They provide a lot of services to the big-box resellers and Tier-1 dealers that the Chinese would struggle to replicate so, it would be a disruptive change requiring significant adjustments by the resellers in order to try and make it work. Perhaps the OEM's increase their rebates by a point or two for a few months to help pay for the transition - who knows? The OEM's are clever, very clever. They know how to play this game so don't be surprised if some variation of this scenario plays out. Furthermore, it's not like they must do all or nothing - they may start off with small, seemingly innocuous moves that we may not even hear about, and then more aggressively when necessary. We rate the chances of the OEM’s playing a leading role in the Chinese increasing their share at the expense of the existing players at a modest, 2 out of 5. All the aftermarket manufacturers (Chinese as well as domestic) are already selling on Amazon, both directly and indirectly. So far, only a relatively small segment of consumers (mainly B2C) have chosen to buy their ink and toner cartridges from this channel. What if Amazon decides to step deeper into the fray? We know they'd like more of the action in the office products vertical - we just don't know how much they want it! We know they've captured consumers (mainly B2C) of office products through their marketplace, and we know they have a decent understanding of the market. We know they'd like the B2B business and we know they've re-vamped their Business Service Division in order to try and win more of this business. We also know Walmart is making a big push into e-commerce and we've recently heard analysts speculating about the potential advantages they may develop over Amazon if they're able to leverage their 5,000 stores as distribution and pick-up centers - just as Best Buy has been successfully doing over the last couple of years. What if Amazon also views Walmart's strategies as a potential threat and decided to snap-up OfficeDepot to counter them? Not only a massive step up for them in terms of the B2B contract stationery business but also 1,400 retail locations that could counter the potential advantages Walmart may be able to develop. 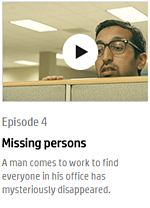 Furthermore, what could Amazon stock those OfficeDepot retail locations with, in the future besides office products? Amazon has a lot going on and it would be enormously risky for them to take on a brick and mortar retailer such as OfficeDepot and to integrate it into its existing business. Furthermore, even if they did, then in order to improve the overall OfficeDepot business model, they'd face the same issues we're going to explain in the following "break-rank" scenario. Bottom line, why would Amazon contemplate buying OfficeDepot if the constraints to improve its business model (i.e. aftermarket cartridges) involved putting the business they had acquired at risk? Overall, we rate the chances of this scenario playing out at a slim 0.5 out of 5. After the Staples deal to acquire OfficeDepot failed, Depot has come out of the mess with all guns firing. They appear to have a plan and are taking decisive action. Their CEO, Roland Smith, declared back on May 16th, 2016, when the deal finally collapsed, that the company's future would depend on "bold new action". Well, what if they decided to take bold new action, unilaterally exited the cartel, and gave more prominence to aftermarket cartridges? Remember the gross margins on OEM sales (after factoring in rebates) are 10-15% whereas they're 65%+ on aftermarket cartridges - potentially even more if they were sourced directly from the Chinese. Let's assume OfficeDepot currently has $3.8 billion in OEM cartridge sales at 10 points of gross margin and $250 million in aftermarket cartridge sales and decided to exit OEM and only offer aftermarket. Let's assume that action resulted in a loss of 50% or $1.9 billion of their existing OEM cartridge business. Then, the remaining $1.9 billion was discounted by 30% (per the aftermarket model) so it became $1.33 billion. However, this $1.33 billion is at 65 points of margin, not 10 points. As shown in the table - that's a new total of just over $1 billion margin dollars, a pick-up of nearly $500MM! Of course, this is a radical scenario with many implications beyond the risk of losing nearly $2.0 billion in cartridge sales. 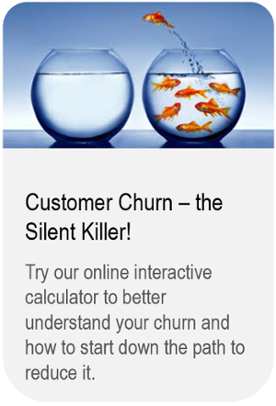 This strategy would put the customer (not just product) retention at serious risk. If ink and toner are 40% of a typical customer's spend on office products, then a $2.0 billion loss in cartridge sales would be likely to compromise $5.0 billion in overall customer sales. That's putting 40% of their North American top line at risk! Much as the management at OfficeDepot may look at the attractive margins on aftermarket ink and toner, and much as they may want to take bold steps forward, we just don't see a successful transition path to the scenario I've described. So, bottom line, this is not a viable path for breaking the cartel and increasing aftermarket share. Unfortunately, Depot is trapped inside the existing cartel arrangement, so we have to rate the likelihood of this path developing as zero out of five. The OEM's don't have much influence over the strategies and tactics of the Tier-2 distributors and the smaller independent office products resellers. Because they don't have much influence, this group may represent a potential future threat to the OEM's, particularly if they were to combine with the newly emerged Chinese aftermarket manufacturing superpowers. This possibility must be worrisome for the OEM's and may account for specific actions, like HP's massive shake-up of its authorized reseller program between 2012 and 2014. This strategy may have been specifically targeted toward weakening a category of resellers they could not control and that (when sufficiently weakened) they did not believe had strong prospects for competing successfully with them in the future. In other words, despite their actions leading to strong levels of resentment within a large group of resellers, they did not believe this action was going to come back and bite them in the future! 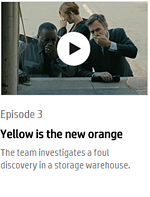 Think for a moment about SGT's acquisition of the global Cartridge World franchise. There are 500 or so franchise locations throughout North America and a similar number scattered in other markets around the globe. This acquisition is a prime example of a Chinese superpower acquiring distribution in order to bypass the current cartel. This is not a franchise focused on the dog-eat-dog world of internet related bottom-feed pricing. This is a franchise focused on its quality, its brand and its physical presence in prominent local markets. This is a franchise focused on the "blue ocean" of OEM conversions, not the "red ocean" of random internet business with high customer churn and razor thin margins. Think for a moment about Office Depot's "store of the future" strategy - this isn't so different from the Cartridge World concept. A smaller, physical presence in local markets with the ability to leverage relationships and minimize customer churn by continuing to deliver a first-class customer experience. Think for a moment about Best Buy. Everyone was predicting they didn't have a future, that they would become a showroom where you could touch and feel products you were interested in before leaving to go and find the best deal online. Who would have thought Best Buy could successfully adapt and to now be showing promising signs of surviving such a major battle against Amazon and other online retailers? What does this developing success story tell us in terms of customers wanting to physically deal with someone as opposed to something? The internet has not eliminated the human desire to interact with real people! What could all this mean for the smaller independent resellers and their future in the office products and supplies space? Firstly, the focus on the "red ocean" of random e-commerce initiatives should be curtailed and there must be a new emphasis on doing what Office Depot, Staples, Tier-1 independent dealers and a franchise like Cartridge World, are doing. These organizations all appear to believe a strong physical presence in local markets is important to their future business prospects. The Tier-2 dealers need to adopt a similar approach. It should not be beyond their means to do so. Firstly, they have ready and willing partners to select from in terms of the Chinese superpower manufacturers. Secondly, the Tier-2 distributors of these Chinese products have the import and the logistics expertise to get products quickly and economically to the reseller's customers. In being prepared to leverage these products and capabilities alongside an upgrade of their individual technology platforms, then there's a possibility to have a meaningful impact in the medium to longer term. However, to be successful with this approach will mean developing sufficient trust and confidence in their capabilities that are necessary to satisfy the performance requirements of the "blue ocean" caliber customers currently served by the Tier-1 retailers and resellers. The development of a sales channel outside of the existing cartel has already started and its future success is likely. For me, the big question is not whether or not this development will succeed, it's more about what the scale of its success will be. If we assume there are 5,000 independent Tier-2 and 3 resellers left in the United States and Canada, and that (for example) Cartridge World makes up 500, or 10% of this number. Is it going to be just 10% that recognize the opportunity to empower themselves for success, or is it going to be 25% or more? Just imagine 1,500 resellers leveraging technology to transform their businesses, just imagine if they each had an average of $1 million in annual sales - that adds up to $1.5 billion in aggregate. Now, that's a potentially significant sales channel development story that would keep the OEM's awake at night! Because of the strength of the existing cartel and its ability to block the growth of the aftermarket, I believe further development of this independent sales channel, that's outside the control of the cartel, is the only viable path to achieving increased aftermarket share. I rate its longer-term likelihood of success at a strong 4 out of 5! The important point to understand is that we're entering a new phase in the development of the office products vertical, that change is likely and, as always, there will be winners and losers. For those that are prepared, change will bring opportunity. For the smaller, local resellers that focus on their value proposition, including developing their ability to compete effectively with the service routinely provided by larger companies, there will be opportunities that can benefit their businesses. However, if instead, they choose to get caught in an online price game with poor quality, potentially infringing products or inadequate information technology systems, then they'll be poorly positioned and will fail to benefit at all. The aftermarket products are well positioned from a technology perspective, from a cost perspective, and from a competitive perspective. Remember, for example, unlike the OEM's, the aftermarket value chain doesn't have to give up any margin dollars subsidizing hardware development or distribution costs. The biggest potential losers, (if the smaller resellers are motivated to step up), stand to be the OEM's and the big-box retailers. A move from 20% to 35% aftermarket share represents an annual shift of over $3.5 billion retail dollars. We know a change of this scale cannot take place through the cartel and, if it's to take place at all, then only the independents can make it so. We've explained how the OEM's have effectively orchestrated a cartel (triggered after the early shock of losing 20% of the monochrome market to the remanufacturers during the 1990's) for the dual purpose of maintaining their pricing model, and for preventing the aftermarket resellers and manufacturers from capturing market share. I've introduced the concept that the recently emerged Chinese aftermarket manufacturing superpowers have sufficient financial power to orchestrate their own strategies that may break the cartel and, if successful, that the share of the $25 billion U.S. market for ink and toner may finally be on the point of moving in favor of the aftermarket. We've presented our views on the OEM, aftermarket, and resellers merger endgames, and explained it's unlikely these events will have any impact on the share between OEM and aftermarket products. If anything, in the absence of the Chinese aftermarket manufacturing superpowers, the OEM's will become even more powerful as their own global mergers endgame plays out. We've explained it's not very likely there will be a significant shift in market shares without the Tier-2 & 3 resellers and distributors stepping up to develop it, because, the only way to develop aftermarket share is to break the cartel, and the only way to break the cartel, is to go around it. The Tier-1 Chinese aftermarket manufacturers have the products, the legal foundation, and the cost structure to support a significant growth in market share. Perhaps anticipating this eventual outcome, a group of second-tier office product and supplies distributors has already emerged to serve the North American markets. These distributors have the necessary expertise for importing the Chinese products as well as the infrastructure to support fast, cost-effective deliveries to the customers of the Tier-2 & 3 resellers. So, we already have the manufacturers, the products, and the distributors in place. What we're missing are the resellers that are necessary to get the products into the hands of the consumers. Now, as we know, the required resellers do, in fact, exist but, over the last few years, they've been jumping into the "Red Ocean" of predatory internet pricing trying to win random customers looking for the lowest prices available. Sure, to do this, they've adopted the low-cost Chinese products because, without them, they couldn't enter the Red Ocean in the first place. However, the problem is, even with the low-cost Chinese products, there's no way for the resellers to make any money. It's a pricing death spiral, there's no profit to fund the development of loyal customers, and there's no infrastructure or strategy for entering the "Blue Ocean" dominated by the Big-Box and Tier-1 resellers. 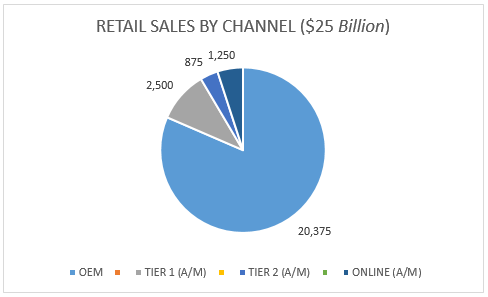 Remember it's a $25 billion annual market and 90% of these retail dollars are currently spent through the Tier-1 channels. These are mostly a mix of Blue Ocean $100 OEM cartridges and Tier-1 $70 aftermarket cartridges, not Red Ocean $10 internet cartridges! This is it in a nutshell. For the aftermarket to increase its share of the market, it must take place with Chinese, patent-safe new-build cartridges, imported by the Tier-2 distributors and sold into the Blue Ocean customer base by the Tier-2 & 3 resellers. Bottom line, any success for the newly emerged Chinese manufacturing superpowers in terms of increased market share in the North American markets, comes down to the ability of the Tier-2 & 3 resellers to step up their game and to develop sufficient capabilities to compete effectively in the Blue Ocean customer base currently paying for OEM and Tier-1 aftermarket cartridges. Well, if this is truly the case, then what's it going to take to achieve the desired outcome? Time - there's no overnight solution. Any reseller who may think there's a quick, simple solution is flat-out wrong and needs to reevaluate or get out of the business. Start thinking of a one-year effort to set the foundation and then 2-4 years to successfully develop a growing and profitable business. Hard work - if anyone's thinking there's a "stay-at-home", "feet-on-the-table", "build-it-and-they-will-come" solution, then they also may be better off closing up shop now and moving on to something different. There is no alternative to achieving a successful outcome, besides combining hard work with modern digital business solutions and business intelligence. Face-to-face relationships in local markets - this is the key. Despite all the fuss about social media, digital marketing, e-commerce, and the internet, at the end of the day, customers in the Blue Ocean like to buy from businesses they know and businesses they trust. This means getting out of the office and getting in front of customers and prospects and developing the necessary relationships. Information Technology - implementation and the use of information technology are not "nice-to-haves" - they are a fundamental requirement. They can't be put off if a reseller wants to compete effectively in the Blue Ocean. 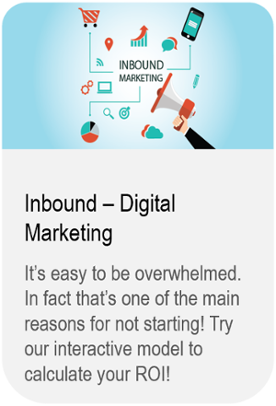 Digital Expertise (website and social media) - like it or not, social media is here to stay and it's where all the marketing dollars are now flowing. It's not easy and it's not a silver bullet. If you don't know what you're doing, then it's likely to be a complete waste of time. However, if you want to survive in the digital era, then an effective social media strategy is a requirement, not an option. Furthermore, attempting to deploy a social media strategy without a modern, content-rich website is also likely to mean it will be a waste of time and money. 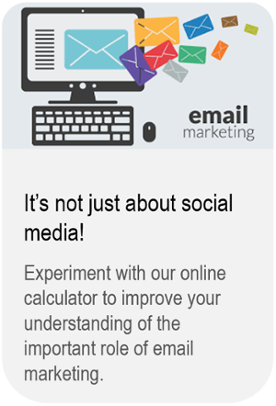 Marketing (leveraging social media and email marketing) - so, even if you have all your social media accounts set up and a decent content-rich website deployed, then, if you don't know how to use them to conduct an effective inbound digital marketing strategy, the investments to establish these capabilities will most likely turn out to be a waste of time and money. If the Tier-2 & 3 resellers fail to show an interest in the substantial growth opportunity that still exists, despite the mature and slowly declining overall market, then the cartel will stay in place and the aftermarket players will be destined to play a bit part to the OEM's and Tier-1 resellers. The problem is, that for many of the weaker Tier-2 & 3 resellers, time is running out. The success of the OEM blocking tactics over the last 15 - 20 years has significantly weakened the channel. Not only are financial resources limited but, perhaps more crucially, the energy necessary to commit the required human resources, along with the will of the independent reseller to survive, have also both been compromised. So, with our ongoing analysis, our observations of the market, and my knowledge of the remaining players and their likely tactics, we have concluded that to achieve the desired outcome of increased aftermarket share, there must be an injection of energy alongside the deployment of a transformational digital solution. The Tier-2 & 3 resellers must be able to take this solution to the market and successfully win profitable business in the Blue Ocean customer environment. Without this, we believe the aftermarket presence will, at best, stagnate, although more likely decline, over the longer term. Should this turn out to be the case, then the OEM strategies will have prevailed and most consumers will continue to pay extraordinarily high prices for their ink and toner cartridges. With only a dozen or so original equipment manufacturers left, between them accounting for over $170 Billion in annual global sales, the office products and business equipment industry is already concentrated. It's likely to become even more so over the next few years. An unexpected move that seems to make perfect sense as Hewlett Packard takes control of its own destiny in laser printing technology with its acquisition of the Samsung Printer Division. After the busted deal with Staples, Office Depot management announced they would be taking bold steps to protect the future of the company from the relentless attack originating from Amazon and others. CompuCom is certainly a bold move and time will tell if the transactional culture at Office Depot can be pivoted toward services. With tens of thousands of products making up the office products and equipment categories, it's inconceivable for resellers to stock a full line of products, so the wholesaler's drop-ship programs perform a vital role in their value proposition. Potential changes in the wholesalers go-to-market strategy, combined with the ever-increasing threat of OEM's selling direct, add up to serious threats to the resellers model. The top 26 players in the global office products and equipment industry had global sales of $420 billion in 2017 and combined to generate over $30B in EBITDA. However, the top five accounts for 60% of the EBITDA and 75% of the debt capacity setting the scene for the mergers endgame. Prior to the intervention of Staples, the merger of SP Richards and Essendant had the potential to improve their combined business outlook as well as those of the thousands of resellers that make up the customer base. Regardless, the wholesalers success is dependent on the reseller and the old-school approach isn't working. Why did Office Depot buy CompuCom and why should independent resellers pay close attention? The Office Depot acquisition of CompuCom has the potential to be a game-changer with profound implications for the future of independent resellers. However, transforming a transactional culture into services is likely to stretch Depot management to the limit and encounter many challenges along the way. Where was the upside in the proposed deal for Fujifilm as they sought to gain control of Xerox and merge it with Fuji Xerox? Control of the iconic Xerox brand was to pass to Fujifilm in a transaction that proposed a Fuji Xerox / Xerox merger for no more than a debt-financed dividend. However, the two largest Xerox shareholders didn't like the deal and went to court to prevent it. Icahn and Deason have had an endgame strategy from the start. All they want is the original Fujifilm deal agreed in early 2017 where Xerox is sold outright to Fujifilm for $40 a share or $10 billion. The endgame is almost upon us and it's starting to look more likely their efforts will succeed. Who would be vulnerable to lose market share in a Fujifilm Xerox merger? Major changes are taking place in the office products industry as the focus switches from transaction-based to service-based business models. Xerox has stagnated and now faces almost insurmountable obstacles to secure its future. A Fujifilm Xerox merger would be unlikely to be sufficient! With the news that Fujifilm wants to take control of Xerox in a Fuji Xerox merger, would this improve the financial outlook for the combined entities or is it simply a combination of two declining businesses that will remain destined to fail? What should small business owners look for when evaluating merger and acquisition strategies for growth or for a sale? What are the key factors that drive business valuations and how important are these for business owners to take into consideration in a mature, declining market? Operating in plain sight, a cartel-like structure for ink and toner cartridges and a market distortion that's created a competitive nightmare for the OEM's. Learn how developments in the industry are creating an opportunity for otherwise struggling independent resellers to grow their business. The Office Products & Equipment industry is mature with M&A activity intensifying causing disruption that adversely impacts independent resellers. For those with a deep understanding of what's taking place, patience, and a strong work ethic, there remains an opportunity for profitable growth. By the time you've read this page, it should come as no surprise that the foundation for a digital transformation is a rule-conforming, content-rich, and mobile-responsive website - a website you can rely on to promote your brand 24/7.